In the end the three men from Arkham—old, white-bearded Dr Armitage, stocky, iron-grey Professor Rice, and lean, youngish Dr Morgan, ascended the mountain alone. After much patient instruction regarding its focusing and use, they left the telescope with the frightened group that remained in the road; and as they climbed they were watched closely by those among whom the glass was passed round. It was hard going, and Armitage had to be helped more than once. High above the toiling group the great swath trembled as its hellish maker repassed with snail-like deliberateness. Then it was obvious that the pursuers were gaining. Curtis Whateley—of the undecayed branch—was holding the telescope when the Arkham party detoured radically from the swath. He told the crowd that the men were evidently trying to get to a subordinate peak which overlooked the swath at a point considerably ahead of where the shrubbery was now bending. This, indeed, proved to be true; and the party were seen to gain the minor elevation only a short time after the invisible blasphemy had passed it. Then Wesley Corey, who had taken the glass, cried out that Armitage was adjusting the sprayer which Rice held, and that something must be about to happen. The crowd stirred uneasily, recalling that his sprayer was expected to give the unseen horror a moment of visibility. Two or three men shut their eyes, but Curtis Whateley snatched back the telescope and strained his vision to the utmost. He saw that Rice, from the party's point of advantage above and behind the entity, had an excellent chance of spreading the potent powder with marvellous effect. Those without the telescope saw only an instant's flash of grey cloud—a cloud about the size of a moderately large building—near the top of the mountain. Curtis, who held the instrument, dropped it with a piercing shriek into the ankle-deep mud of the road. He reeled, and would have crumbled to the ground had not two or three others seized and steadied him. All he could do was moan half-inaudibly. This final memory, whatever it was, proved too much for poor Curtis; and he collapsed completely before he could say more. Fred Farr and Will Hutchins carried him to the roadside and laid him on the damp grass. Henry Wheeler, trembling, turned the rescued telescope on the mountain to see what he might. Through the lenses were discernible three tiny figures, apparently running towards the summit as fast as the steep incline allowed. Only these—nothing more. Then everyone noticed a strangely unseasonable noise in the deep valley behind, and even in the underbrush of Sentinel Hill itself. It was the piping of unnumbered whippoorwills, and in their shrill chorus there seemed to lurk a note of tense and evil expectancy. Earl Sawyer now took the telescope and reported the three figures as standing on the topmost ridge, virtually level with the altar-stone but at a considerable distance from it. One figure, he said, seemed to be raising its hands above its head at rhythmic intervals; and as Sawyer mentioned the circumstance the crowd seemed to hear a faint, half-musical sound from the distance, as if a loud chant were accompanying the gestures. The weird silhouette on that remote peak must have been a spectacle of infinite grotesqueness and impressiveness, but no observer was in a mood for aesthetic appreciation. 'I guess he's sayin' the spell,' whispered Wheeler as he snatched back the telescope. The whippoorwills were piping wildly, and in a singularly curious irregular rhythm quite unlike that of the visible ritual. The change in the quality of the daylight increased, and the crowd gazed about the horizon in wonder. A purplish darkness, born of nothing more than a spectral deepening of the sky's blue, pressed down upon the rumbling hills. Then the lightning flashed again, somewhat brighter than before, and the crowd fancied that it had showed a certain mistiness around the altar-stone on the distant height. No one, however, had been using the telescope at that instant. The whippoorwills continued their irregular pulsation, and the men of Dunwich braced themselves tensely against some imponderable menace with which the atmosphere seemed surcharged. Without warning came those deep, cracked, raucous vocal sounds which will never leave the memory of the stricken group who heard them. Not from any human throat were they born, for the organs of man can yield no such acoustic perversions. Rather would one have said they came from the pit itself, had not their source been so unmistakably the altar-stone on the peak. It is almost erroneous to call them sounds at all, since so much of their ghastly, infra-bass timbre spoke to dim seats of consciousness and terror far subtler than the ear; yet one must do so, since their form was indisputably though vaguely that of half-articulate words. They were loud—loud as the rumblings and the thunder above which they echoed—yet did they come from no visible being. And because imagination might suggest a conjectural source in the world of non-visible beings, the huddled crowd at the mountain's base huddled still closer, and winced as if in expectation of a blow. But that was all. The pallid group in the road, still reeling at the indisputably English syllables that had poured thickly and thunderously down from the frantic vacancy beside that shocking altar-stone, were never to hear such syllables again. Instead, they jumped violently at the terrific report which seemed to rend the hills; the deafening, cataclysmic peal whose source, be it inner earth or sky, no hearer was ever able to place. A single lightning bolt shot from the purple zenith to the altar-stone, and a great tidal wave of viewless force and indescribable stench swept down from the hill to all the countryside. Trees, grass, and under-brush were whipped into a fury; and the frightened crowd at the mountain's base, weakened by the lethal foetor that seemed about to asphyxiate them, were almost hurled off their feet. Dogs howled from the distance, green grass and foliage wilted to a curious, sickly yellow-grey, and over field and forest were scattered the bodies of dead whippoorwills. The stench left quickly, but the vegetation never came right again. To this day there is something queer and unholy about the growths on and around that fearsome hill. Curtis Whateley was only just regaining consciousness when the Arkham men came slowly down the mountain in the beams of a sunlight once more brilliant and untainted. They were grave and quiet, and seemed shaken by memories and reflections even more terrible than those which had reduced the group of natives to a state of cowed quivering. In reply to a jumble of questions they only shook their heads and reaffirmed one vital fact. 'It was—well, it was mostly a kind of force that doesn't belong in our part of space; a kind of force that acts and grows and shapes itself by other laws than those of our sort of Nature. We have no business calling in such things from outside, and only very wicked people and very wicked cults ever try to. There was some of it in Wilbur Whateley himself—enough to make a devil and a precocious monster of him, and to make his passing out a pretty terrible sight. I'm going to burn his accursed diary, and if you men are wise you'll dynamite that altar-stone up there, and pull down all the rings of standing stones on the other hills. Things like that brought down the beings those Whateleys were so fond of—the beings they were going to let in tangibly to wipe out the human race and drag the earth off to some nameless place for some nameless purpose. Friday morning Armitage, Rice, and Morgan set out by motor for Dunwich, arriving at the village about one in the afternoon. The day was pleasant, but even in the brightest sunlight a kind of quiet dread and portent seemed to hover about the strangely domed hills and the deep, shadowy ravines of the stricken region. Now and then on some mountain top a gaunt circle of stones could be glimpsed against the sky. From the air of hushed fright at Osborn's store they knew something hideous had happened, and soon learned of the annihilation of the Elmer Frye house and family. Throughout that afternoon they rode around Dunwich, questioning the natives concerning all that had occurred, and seeing for themselves with rising pangs of horror the drear Frye ruins with their lingering traces of the tarry stickiness, the blasphemous tracks in the Frye yard, the wounded Seth Bishop cattle, and the enormous swaths of disturbed vegetation in various places. The trail up and down Sentinel Hill seemed to Armitage of almost cataclysmic significance, and he looked long at the sinister altar-like stone on the summit. A cold shudder ran through natives and visitors alike, and every ear seemed strained in a kind of instinctive, unconscious listening. Armitage, now that he had actually come upon the horror and its monstrous work, trembled with the responsibility he felt to be his. Night would soon fall, and it was then that the mountainous blasphemy lumbered upon its eldritch course. Negotium perambuians in tenebris... The old librarian rehearsed the formulae he had memorized, and clutched the paper containing the alternative one he had not memorized. He saw that his electric flashlight was in working order. Rice, beside him, took from a valise a metal sprayer of the sort used in combating insects; whilst Morgan uncased the big-game rifle on which he relied despite his colleague's warnings that no material weapon would be of help. Armitage, having read the hideous diary, knew painfully well what kind of a manifestation to expect; but he did not add to the fright of the Dunwich people by giving any hints or clues. He hoped that it might be conquered without any revelation to the world of the monstrous thing it had escaped. As the shadows gathered, the natives commenced to disperse homeward, anxious to bar themselves indoors despite the present evidence that all human locks and bolts were useless before a force that could bend trees and crush houses when it chose. They shook their heads at the visitors' plan to stand guard at the Frye ruins near the glen; and, as they left, had little expectancy of ever seeing the watchers again. 'Nigh on a haour ago Zeb Whateley here heered the 'phone a-ringin', an' it was Mis' Corey, George's wife, that lives daown by the junction. She says the hired boy Luther was aout drivin' in the caows from the storm arter the big bolt, when he see all the trees a-bendin' at the maouth o' the glen—opposite side ter this—an' smelt the same awful smell like he smelt when he faound the big tracks las' Monday mornin'. An' she says he says they was a swishin' lappin' saound, more nor what the bendin' trees an' bushes could make, an' all on a suddent the trees along the rud begun ter git pushed one side, an' they was a awful stompin' an' splashin' in the mud. But mind ye, Luther he didn't see nothin' at all, only just the bendin' trees an' underbrush. 'But that ain't the trouble naow—that was only the start. Zeb here was callin' folks up an' everybody was a-listenin' in when a call from Seth Bishop's cut in. His haousekeeper Sally was carryin' on fit to kill—she'd jest seed the trees a-bendin' beside the rud, an' says they was a kind o' mushy saound, like a elephant puffin' an' treadin', a-headin' fer the haouse. Then she up an' spoke suddent of a fearful smell, an' says her boy Cha'ncey was a-screamin' as haow it was jest like what he smelt up to the Whateley rewins Monday mornin'. An' the dogs was barkin' an' whinin' awful. 'We must follow it, boys.' He made his voice as reassuring as possible. 'I believe there's a chance of putting it out of business. You men know that those Whateleys were wizards—well, this thing is a thing of wizardry, and must be put down by the same means. I've seen Wilbur Whateley's diary and read some of the strange old books he used to read; and I think I know the right kind of spell to recite to make the thing fade away. Of course, one can't be sure, but we can always take a chance. It's invisible—I knew it would be—but there's powder in this long-distance sprayer that might make it show up for a second. Later on we'll try it. It's a frightful thing to have alive, but it isn't as bad as what Wilbur would have let in if he'd lived longer. You'll never know what the world escaped. Now we've only this one thing to fight, and it can't multiply. It can, though, do a lot of harm; so we mustn't hesitate to rid the community of it. As the men passed the site of Wilbur Whateley's abode they shuddered visibly, and seemed again to mix hesitancy with their zeal. It was no joke tracking down something as big as a house that one could not see, but that had all the vicious malevolence of a daemon. Opposite the base of Sentinel Hill the tracks left the road, and there was a fresh bending and matting visible along the broad swath marking the monster's former route to and from the summit. Armitage produced a pocket telescope of considerable power and scanned the steep green side of the hill. Then he handed the instrument to Morgan, whose sight was keener. After a moment of gazing Morgan cried out sharply, passing the glass to Earl Sawyer and indicating a certain spot on the slope with his finger. Sawyer, as clumsy as most non-users of optical devices are, fumbled a while; but eventually focused the lenses with Armitage's aid. When he did so his cry was less restrained than Morgan's had been. Then the germ of panic seemed to spread among the seekers. It was one thing to chase the nameless entity, but quite another to find it. Spells might be all right—but suppose they weren't? Voices began questioning Armitage about what he knew of the thing, and no reply seemed quite to satisfy. Everyone seemed to feel himself in close proximity to phases of Nature and of being utterly forbidden and wholly outside the sane experience of mankind. In the meantime a quieter yet even more spiritually poignant phase of the horror had been blackly unwinding itself behind the closed door of a shelf-lined room in Arkham. The curious manuscript record or diary of Wilbur Whateley, delivered to Miskatonic University for translation had caused much worry and bafflement among the experts in language both ancient and modern; its very alphabet, notwithstanding a general resemblance to the heavily-shaded Arabic used in Mesopotamia, being absolutely unknown to any available authority. The final conclusion of the linguists was that the text represented an artificial alphabet, giving the effect of a cipher; though none of the usual methods of cryptographic solution seemed to furnish any clue, even when applied on the basis of every tongue the writer might conceivably have used. The ancient books taken from Whateley's quarters, while absorbingly interesting and in several cases promising to open up new and terrible lines of research among philosophers and men of science, were of no assistance whatever in this matter. One of them, a heavy tome with an iron clasp, was in another unknown alphabet—this one of a very different cast, and resembling Sanskrit more than anything else. The old ledger was at length given wholly into the charge of Dr Armitage, both because of his peculiar interest in the Whateley matter, and because of his wide linguistic learning and skill in the mystical formulae of antiquity and the middle ages. Dr Armitage knew, from the repeated failures of his colleagues, that the riddle was a deep and complex one; and that no simple mode of solution could merit even a trial. All through late August he fortified himself with the mass lore of cryptography; drawing upon the fullest resources of his own library, and wading night after night amidst the arcana of Trithemius' Poligraphia, Giambattista Porta's De Furtivis Literarum Notis, De Vigenere's Traite des Chiffres, Falconer's Cryptomenysis Patefacta, Davys' and Thicknesse's eighteenth-century treatises, and such fairly modern authorities as Blair, van Marten and Kluber's script itself, and in time became convinced that he had to deal with one of those subtlest and most ingenious of cryptograms, in which many separate lists of corresponding letters are arranged like the multiplication table, and the message built up with arbitrary key-words known only to the initiated. The older authorities seemed rather more helpful than the newer ones, and Armitage concluded that the code of the manuscript was one of great antiquity, no doubt handed down through a long line of mystical experimenters. Several times he seemed near daylight, only to be set back by some unforeseen obstacle. Then, as September approached, the clouds began to clear. Certain letters, as used in certain parts of the manuscript, emerged definitely and unmistakably; and it became obvious that the text was indeed in English. On the evening of September second the last major barrier gave way, and Dr Armitage read for the first time a continuous passage of Wilbur Whateley's annals. It was in truth a diary, as all had thought; and it was couched in a style clearly showing the mixed occult erudition and general illiteracy of the strange being who wrote it. Almost the first long passage that Armitage deciphered, an entry dated November 26, 1916, proved highly startling and disquieting. It was written,he remembered, by a child of three and a half who looked like a lad of twelve or thirteen. Today learned the Aklo for the Sabaoth (it ran), which did not like, it being answerable from the hill and not from the air. That upstairs more ahead of me than I had thought it would be, and is not like to have much earth brain. Shot Elam Hutchins's collie Jack when he went to bite me, and Elam says he would kill me if he dast. I guess he won't. Grandfather kept me saying the Dho formula last night, and I think I saw the inner city at the 2 magnetic poles. I shall go to those poles when the earth is cleared off, if I can't break through with the Dho-Hna formula when I commit it. They from the air told me at Sabbat that it will be years before I can clear off the earth, and I guess grandfather will be dead then, so I shall have to learn all the angles of the planes and all the formulas between the Yr and the Nhhngr. They from outside will help, but they cannot take body without human blood. That upstairs looks it will have the right cast. I can see it a little when I make the Voorish sign or blow the powder of Ibn Ghazi at it, and it is near like them at May Eve on the Hill. The other face may wear off some. I wonder how I shall look when the earth is cleared and there are no earth beings on it. He that came with the Aklo Sabaoth said I may be transfigured there being much of outside to work on. Morning found Dr Armitage in a cold sweat of terror and a frenzy of wakeful concentration. He had not left the manuscript all night, but sat at his table under the electric light turning page after page with shaking hands as fast as he could decipher the cryptic text. He had nervously telephoned his wife he would not be home, and when she brought him a breakfast from the house he could scarcely dispose of a mouthful. All that day he read on, now and then halted maddeningly as a reapplication of the complex key became necessary. Lunch and dinner were brought him, but he ate only the smallest fraction of either. Toward the middle of the next night he drowsed off in his chair, but soon woke out of a tangle of nightmares almost as hideous as the truths and menaces to man's existence that he had uncovered. But Armitage had a sound physique despite his seventy-three years, and slept off his disorder that night without developing any real fever. He woke late Friday, clear of head, though sober with a gnawing fear and tremendous sense of responsibility. Saturday afternoon he felt able to go over to the library and summon Rice and Morgan for a conference, and the rest of that day and evening the three men tortured their brains in the wildest speculation and the most desperate debate. Strange and terrible books were drawn voluminously from the stack shelves and from secure places of storage; and diagrams and formulae were copied with feverish haste and in bewildering abundance. Of scepticism there was none. All three had seen the body of Wilbur Whateley as it lay on the floor in a room of that very building, and after that not one of them could feel even slightly inclined to treat the diary as a madman's raving. Opinions were divided as to notifying the Massachusetts State Police, and the negative finally won. There were things involved which simply could not be believed by those who had not seen a sample, as indeed was made clear during certain subsequent investigations. Late at night the conference disbanded without having developed a definite plan, but all day Sunday Armitage was busy comparing formulae and mixing chemicals obtained from the college laboratory. The more he reflected on the hellish diary, the more he was inclined to doubt the efficacy of any material agent in stamping out the entity which Wilbur Whateley had left behind him—the earth threatening entity which, unknown to him, was to burst forth in a few hours and become the memorable Dunwich horror. The Dunwich horror itself came between Lammas and the equinox in 1928, and Dr Armitage was among those who witnessed its monstrous prologue. He had heard, meanwhile, of Whateley's grotesque trip to Cambridge, and of his frantic efforts to borrow or copy from the Necronomicon at the Widener Library. Those efforts had been in vain, since Armitage had issued warnings of the keenest intensity to all librarians having charge of the dreaded volume. Wilbur had been shockingly nervous at Cambridge; anxious for the book, yet almost equally anxious to get home again, as if he feared the results of being away long. Early in August the half-expected outcome developed, and in the small hours of the third Dr Armitage was awakened suddenly by the wild, fierce cries of the savage watchdog on the college campus. Deep and terrible, the snarling, half-mad growls and barks continued; always in mounting volume, but with hideously significant pauses. Then there rang out a scream from a wholly different throat—such a scream as roused half the sleepers of Arkham and haunted their dreams ever afterwards—such a scream as could come from no being born of earth, or wholly of earth. The building was full of a frightful stench which Dr Armitage knew too well, and the three men rushed across the hall to the small genealogical reading-room whence the low whining came. For a second nobody dared to turn on the light, then Armitage summoned up his courage and snapped the switch. One of the three—it is not certain which—shrieked aloud at what sprawled before them among disordered tables and overturned chairs. Professor Rice declares that he wholly lost consciousness for an instant, though he did not stumble or fall. The thing that lay half-bent on its side in a foetid pool of greenish-yellow ichor and tarry stickiness was almost nine feet tall, and the dog had torn off all the clothing and some of the skin. It was not quite dead, but twitched silently and spasmodically while its chest heaved in monstrous unison with the mad piping of the expectant whippoorwills outside. Bits of shoe-leather and fragments of apparel were scattered about the room, and just inside the window an empty canvas sack lay where it had evidently been thrown. Near the central desk a revolver had fallen, a dented but undischarged cartridge later explaining why it had not been fired. The thing itself, however, crowded out all other images at the time. It would be trite and not wholly accurate to say that no human pen could describe it, but one may properly say that it could not be vividly visualized by anyone whose ideas of aspect and contour are too closely bound up with the common life-forms of this planet and of the three known dimensions. It was partly human, beyond a doubt, with very manlike hands and head, and the goatish, chinless face had the stamp of the Whateley's upon it. But the torso and lower parts of the body were teratologically fabulous, so that only generous clothing could ever have enabled it to walk on earth unchallenged or uneradicated. Above the waist it was semi-anthropomorphic; though its chest, where the dog's rending paws still rested watchfully, had the leathery, reticulated hide of a crocodile or alligator. The back was piebald with yellow and black, and dimly suggested the squamous covering of certain snakes. Below the waist, though, it was the worst; for here all human resemblance left off and sheer phantasy began. The skin was thickly covered with coarse black fur, and from the abdomen a score of long greenish-grey tentacles with red sucking mouths protruded limply. Their arrangement was odd, and seemed to follow the symmetries of some cosmic geometry unknown to earth or the solar system. On each of the hips, deep set in a kind of pinkish, ciliated orbit, was what seemed to be a rudimentary eye; whilst in lieu of a tail there depended a kind of trunk or feeler with purple annular markings, and with many evidences of being an undeveloped mouth or throat. The limbs, save for their black fur, roughly resembled the hind legs of prehistoric earth's giant saurians, and terminated in ridgy-veined pads that were neither hooves nor claws. When the thing breathed, its tail and tentacles rhythmically changed colour, as if from some circulatory cause normal to the non-human greenish tinge, whilst in the tail it was manifest as a yellowish appearance which alternated with a sickly grayish-white in the spaces between the purple rings. Of genuine blood there was none; only the foetid greenish-yellow ichor which trickled along the painted floor beyond the radius of the stickiness, and left a curious discoloration behind it. As the presence of the three men seemed to rouse the dying thing, it began to mumble without turning or raising its head. Dr Armitage made no written record of its mouthings, but asserts confidently that nothing in English was uttered. At first the syllables defied all correlation with any speech of earth, but towards the last there came some disjointed fragments evidently taken from the Necronomicon, that monstrous blasphemy in quest of which the thing had perished. These fragments, as Armitage recalls them, ran something like 'N'gai, n'gha'ghaa, bugg-shoggog, y'hah: Yog-Sothoth, Yog-Sothoth ...' They trailed off into nothingness as the whippoorwills shrieked in rhythmical crescendos of unholy anticipation. The following winter brought an event no less strange than Wilbur's first trip outside the Dunwich region. Correspondence with the Widener Library at Harvard, the Bibliothèque Nationale in Paris, the British Museum, the University of Buenos Ayres, and the Library of Miskatonic University at Arkham had failed to get him the loan of a book he desperately wanted; so at length he set out in person, shabby, dirty, bearded, and uncouth of dialect, to consult the copy at Miskatonic, which was the nearest to him geographically. Almost eight feet tall, and carrying a cheap new valise from Osborne's general store, this dark and goatish gargoyle appeared one day in Arkham in quest of the dreaded volume kept under lock and key at the college library—the hideous Necronomicon of the mad Arab Abdul Alhazred in Olaus Wormius' Latin version, as printed in Spain in the seventeenth century. He had never seen a city before, but had no thought save to find his way to the university grounds; where indeed, he passed heedlessly by the great white-fanged watchdog that barked with unnatural fury and enmity, and tugged frantically at its stout chain. Wilbur had with him the priceless but imperfect copy of Dr Dee's English version which his grandfather had bequeathed him, and upon receiving access to the Latin copy he at once began to collate the two texts with the aim of discovering a certain passage which would have come on the 751st page of his own defective volume. This much he could not civilly refrain from telling the librarian—the same erudite Henry Armitage (A.M. Miskatonic, Ph.D. Princeton, Litt.D. Johns Hopkins) who had once called at the farm, and who now politely plied him with questions. He was looking, he had to admit, for a kind of formula or incantation containing the frightful name Yog-Sothoth, and it puzzled him to find discrepancies, duplications, and ambiguities which made the matter of determination far from easy. As he copied the formula he finally chose, Dr Armitage looked involuntarily over his shoulder at the open pages; the left-hand one of which, in the Latin version, contained such monstrous threats to the peace and sanity of the world. Nor is it to be thought (ran the text as Armitage mentally translated it) that man is either the oldest or the last of earth's masters, or that the common bulk of life and substance walks alone. The Old Ones were, the Old Ones are, and the Old Ones shall be. Not in the spaces we know, but between them, they walk serene and primal, undimensioned and to us unseen. Yog-Sothoth knows the gate. Yog-Sothoth is the gate. Yog-Sothoth is the key and guardian of the gate. Past, present, future, all are one in Yog-Sothoth. He knows where the Old Ones broke through of old, and where They shall break through again. He knows where They had trod earth's fields, and where They still tread them, and why no one can behold Them as They tread. By Their smell can men sometimes know Them near, but of Their semblance can no man know, saving only in the features of those They have begotten on mankind; and of those are there many sorts, differing in likeness from man's truest eidolon to that shape without sight or substance which is Them. They walk unseen and foul in lonely places where the Words have been spoken and the Rites howled through at their Seasons. The wind gibbers with Their voices, and the earth mutters with Their consciousness. They bend the forest and crush the city, yet may not forest or city behold the hand that smites. Kadath in the cold waste hath known Them, and what man knows Kadath? The ice desert of the South and the sunken isles of Ocean hold stones whereon Their seal is engraved, but who hath seen the deep frozen city or the sealed tower long garlanded with seaweed and barnacles? Great Cthulhu is Their cousin, yet can he spy Them only dimly. Iä! Shub-Niggurath! As a foulness shall ye know Them. Their hand is at your throats, yet ye see Them not; and Their habitation is even one with your guarded threshold. Yog-Sothoth is the key to the gate, whereby the spheres meet. Man rules now where They ruled once; They shall soon rule where man rules now. After summer is winter, after winter summer. They wait patient and potent, for here shall They reign again. Dr. Armitage, associating what he was reading with what he had heard of Dunwich and its brooding presences, and of Wilbur Whateley and his dim, hideous aura that stretched from a dubious birth to a cloud of probable matricide, felt a wave of fright as tangible as a draught of the tomb's cold clamminess. The bent, goatish giant before him seemed like the spawn of another planet or dimension; like something only partly of mankind, and linked to black gulfs of essence and entity that stretch like titan phantasms beyond all spheres of force and matter, space and time. Presently Wilbur raised his head and began speaking in that strange, resonant fashion which hinted at sound-producing organs unlike the run of mankind's. He stopped as he saw firm denial on the librarian's face, and his own goatish features grew crafty. Armitage, half-ready to tell him he might make a copy of what parts he needed, thought suddenly of the possible consequences and checked himself. There was too much responsibility in giving such a being the key to such blasphemous outer spheres. Whateley saw how things stood, and tried to answer lightly. 'Wal, all right, ef ye feel that way abaout it. Maybe Harvard won't be so fussy as yew be.' And without saying more he rose and strode out of the building, stooping at each doorway. Armitage heard the savage yelping of the great watchdog, and studied Whateley's gorilla-like lope as he crossed the bit of campus visible from the window. He thought of the wild tales he had heard, and recalled the old Sunday stories in the Advertiser; these things, and the lore he had picked up from Dunwich rustics and villagers during his one visit there. Unseen things not of earth—or at least not of tridimensional earth—rushed foetid and horrible through New England's glens, and brooded obscenely on the mountain tops. Of this he had long felt certain. Now he seemed to sense the close presence of some terrible part of the intruding horror, and to glimpse a hellish advance in the black dominion of the ancient and once passive nightmare. He locked away the Necronomicon with a shudder of disgust, but the room still reeked with an unholy and unidentifiable stench. 'As a foulness shall ye know them,' he quoted. Yes—the odour was the same as that which had sickened him at the Whateley farmhouse less than three years before. He thought of Wilbur, goatish and ominous, once again, and laughed mockingly at the village rumours of his parentage. During the ensuing weeks Dr Armitage set about to collect all possible data on Wilbur Whateley and the formless presences around Dunwich. 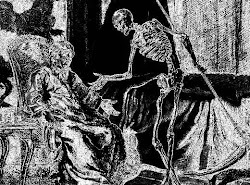 He got in communication with Dr Houghton of Aylesbury, who had attended Old Whateley in his last illness, and found much to ponder over in the grandfather's last words as quoted by the physician. A visit to Dunwich Village failed to bring out much that was new; but a close survey of the Necronomicon, in those parts which Wilbur had sought so avidly, seemed to supply new and terrible clues to the nature, methods, and desires of the strange evil so vaguely threatening this planet. Talks with several students of archaic lore in Boston, and letters to many others elsewhere, gave him a growing amazement which passed slowly through varied degrees of alarm to a state of really acute spiritual fear. As the summer drew on he felt dimly that something ought to be done about the lurking terrors of the upper Miskatonic valley, and about the monstrous being known to the human world as Wilbur Whateley.